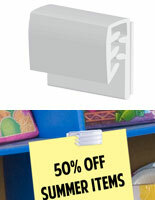 Does your merchandise need more attention drawn to it with impactful adhesive price clips? This line of badge holder systems helps storeowners advertise the cost or type of an item without calling upon staff resources. These pin signs come in unique decorative designs. 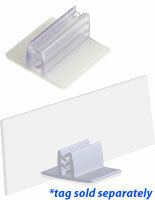 Adhesive price clips are competitively priced to begin with, but purchased in bulk they are extraordinarily cheap! There is a massive variety of tags for sale that will draw attention to your goods! These adhesive price clips, also known as sign clamps, are available in a variety of constructions suited to a myriad of goods and store environments. These plastic sign holders for shopping helps retailers sell bread, cheese, wine, cold cuts, selections of deli meat, olives - or other types of goods in a large storefront. Increase customers awareness, boost sales, and add to your shop décor with some fun designs! 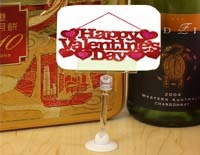 The adhesive price clips serve multiple functions at a time. What styles are available in this line of retail pricing badges? 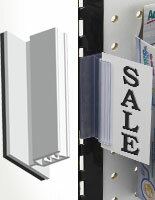 Adhesive price clips stick to shelves and racks and are sold in 100s. 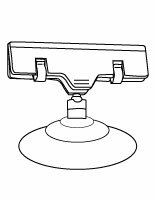 Suction cup base mounts to flat non-porous surfaces like glass or metal. 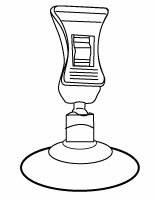 Plastic stand with swiveling ball joint design have chrome plated accent. Slide-in plastic frame has wet-erase board, but fits printed cards, too. PVC grips hold signage while a magnetic base affixes to metal shelves or racks. Affordable clamps become even more so when purchased in bulk, and this site offers convenient same-day shipping for in-stock supplies! With a plethora of decorative styles, colors, and construction materials to choose from, these wire and acrylic pins boost sales by selling merchandise quickly; having goods labeled ahead of time also takes pressure off staff to answer questions. Conveniently, some of these holders come with suggested pricing, number wheels, or replaceable numbers and lettering so merchandisers can customize costs in a professional manner. It’s super-easy to update prices and information using the wet erase marker supplies available here for sale. Place one of these badges in meats or salads offered behind the deli counter with everything described on a tag, from pounds, to cost, to ingredients, to special sales. The decorative bases have a sleek design that means business! But they are also lots of fun to “decorate” with. Browse the StoreFixtures.com online catalog for a plethora of useful, stylish merchandising tools for boutiques, galleries, offices, shops, and restaurants! This company is a leading manufacturer of point of sale and purchase supplies. Our prices are super-competitive, and our shipping super-fast! Want same-day shipping? Talk with our friendly custom service staff about that opportunity! Call today!